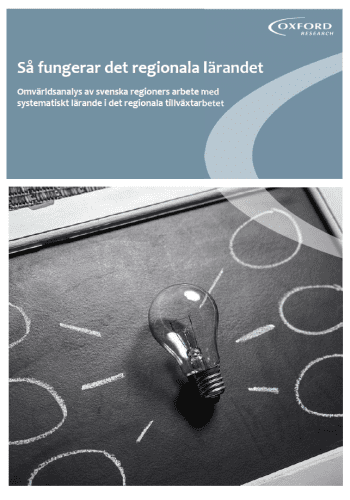 During the spring of 2019, Oxford Research conducted a mapping and analysis on behalf of Region Örebro County (RÖC) concerning how other Swedish regions analyse, evaluate and monitor their Regional Development Strategies (RDS). The purpose of the assignment was to provide inspiration, feedback and input for Region Örebro County in how to develop and improve their own monitoring and analytical work linked to their RDS. Oxford Research collected information through desk research, interviews, and using established networks and contacts, and provided input on frequency, structure, themes, methods, data sources and practical considerations for analyses and monitoring of various RDS. In addition, the integration of sustainability and societal challenges in regional analyses was considered. The results were delivered both in the form of a collaborative workshop and in a written report that can be downloaded on the right.